This was the first picture I took with the Cameo, 9/12/84. The film used was Ilford FP4 sheet film, with the plate carrier packed out with thin modelers plywood to prevent the plate carier springs from bending the sheet film. This was the final choice having experimented with making glass plates to no avail, the sheet film is an easy route in the end. Unfortunately no contemporary pictures have been found that can be definitely attributed to this camera. Left, taken late in the evening May 2001 , this picture was exposed with the lens at the widest aperture, the depth of field is consequently very short. Edge to edge definition is pretty bad at these settings, but if anything - when used for this type of picture it enhances the result. 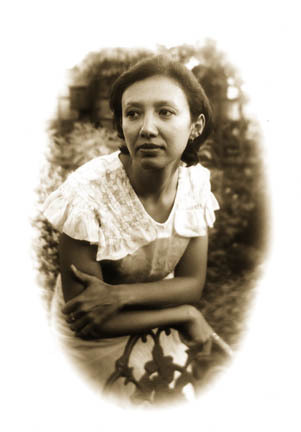 The Cameo is still capable of producing pleasing results, aided here with the subject suitably attired in period clothes (well not quite, the dress is c1935) and the resulting picture sepia toned. 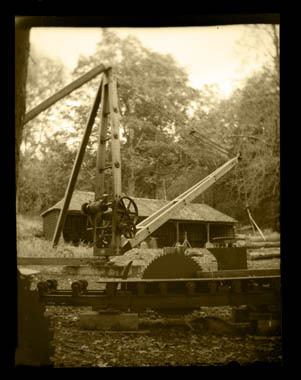 The image was taken at the Weald and Downland Museum and illustrates the recently restored and installed wooden framed crane. Entirely powered by hand the crane isn't merely an exhibit but a useful addition to their sawmill used to produce parts for the growing collection of buildings preserved on site.